Van Gogh was so pioneering, because he proved it possible to remain true to tradition without necessarily stopping at the outward appearance of reality. 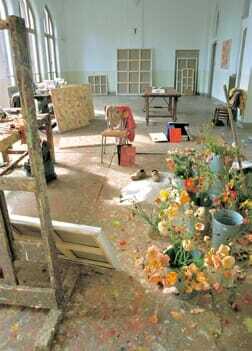 He showed that working from nature could also be interpreted as the devotion to a shabby interior, old shoes, cypresses, sunflowers and irises, the wish to give a heart and soul to splinters and grass, to breathe life into them, so that what is imagined doesn’t remain dead but is resurrected in paint. The work of Marc Mulders, which has always emphatically established its relationship to the tradition of art history—and, to that end, entered into a dialogue with predecessors such as Duccio di Buoninsegna, Dürer, Mantegna, Rembrandt, Monet, Soutine, Bacon and others—confronts us with art which does not bring life to a halt and freeze it, but aims rather to reveal it in its pulsating and bustling vitality. As was previously the case with Van Gogh, his version of ‘back to nature’ has little or nothing to do with realism. In painting which constituted the norm since the early Renaissance and well into the nineteenth century, the aim was to imitate life in an illusory, true-to-life portrayal of reality. The more the movement in the image was brought to a halt, the more successful that imitation would be. Mulders, on the other hand, invariably seeks to maintain the gesture in the image, the time-lag effect of the gesture with which the brush moves across the canvas. His way of dealing with the paint and canvas is primarily defined by action. For that reason he sensed, early on in his development as a painter, an affinity with such figures as Jackson Pollock and Willem de Kooning. The gesture with which Marc Mulders works always remains recognizable in the ultimate order imposed on the paint as a substance. 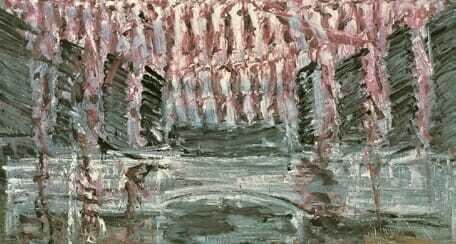 Particularly in his early work, that structuring has the character of a struggle with the material. 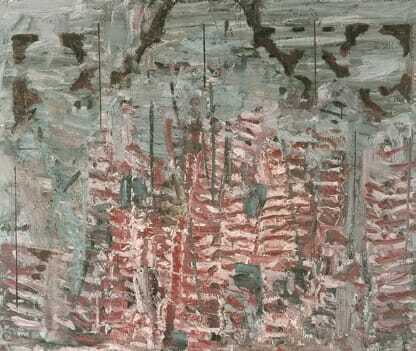 Many paintings show the scars of rough treatment and gouges made while he went at them with the brush and palette knife. Their resemblance to a tanned hide suggests a form of life that continues in the final product, which thereby takes on the dynamics of the tentative. With Mulders the accent lies not with a rendering of nature, but with its assimilation, transformation and sublimation. Painted bodies are no longer depictions, that is to say representations of real models, but images that trans-cend reality. They have undergone transsubstantiation, from flesh into paint, and can no longer be classified as any manifestation of conventional reality. In their capacity as sovereign phenomena, they have been endowed with a vital energy that runs radically counter to earthly death. To illustrate, and give substance to these abstract descriptions: Marc Mulders produces a series of three scenes involving wild game during the winter of 1991/1992. There are four pheasants, painted in various states of plumage and decay. What strikes the eye first and foremost in these paintings is the dynamic nature of the image. The distinctly visible strokes with which the paint has been applied suggest that the birds are being watched as they drop to the ground. Like a quartet of parachutists forming a circle as they fall, the grouped pheasants have flapped open their wings and whirl downward in a fan of feathers. The main difference between these as well as other scenes of wild game painted by Mulders and the traditional genre of still life with dead game, painted with particular frequency during the seventeenth century, is that with Mulders the fleeting quality of life is not put across by way of motionlessness: it becomes visible through vehement dynamics. The rhythmic way in which the paint is applied not only suggests vitality—it is vitality. 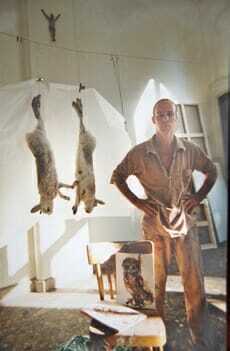 That can also be said with respect to his paintings in which mutilated carcasses and boned flesh can be seen. The bull’s head which dominates Stilleven II (1988) seems, due to the rotation of its horns, to continue beyond the edges of the image. 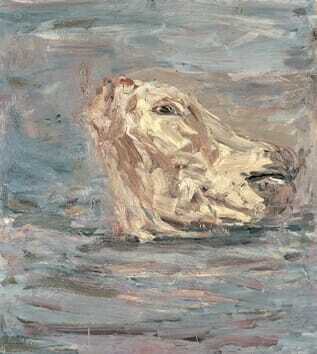 The chopped-off head of a sheep in Corpo di Napoli I  (1989) is painted in such a way that its bleating agony can almost be heard. Ossekop liggend Madrid (1988- 1990) highlights the evidence of the immense ritual drama that the bullfight is by virtue of its nature and origins. And finally, the crucified, doubling image of Christ (a motif to which Mulders repeatedly returns in his early work) refers to the transitional stage between entombment and resurrection because of the body’s detachment from the background in a nearly floating position. These and other paintings from the late 1980s can, without much difficulty, be linked with the notions of sacrifice and violence. Here it is tempting to discern a parallel with the cave drawings of Lascaux and Altamira, which are generally regarded as manifestations of the religious respect with which prehistoric man treated animal prey and, moreover, of his distinct awareness that the human and the divine shared a sacred bond. Here a striking analogy can also be detected between the Christian narrative of the Passion and Resurrection and the Oriental and ancient Greek fertility myths, concerning a god which eventually rose from the dead after having been violently slayed and often torn to shreds. The tales about Osiris, Dionysus, Orpheus and Attis gave rise to the context within which the first Evangelists lived and wrote. For this reason alone, it is not odd that Christianizing art frequently leads to powerful, even shocking portrayals of Christ’s sacrificial death. Painters such as Grünewald, Mantegna and Rembrandt—names that figure prominently, not by coincidence, in Mulders’s canon—are among the masters. 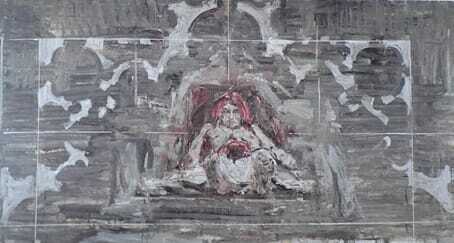 Mulders’s painting Ecce Homo (1989) should be pointed out in connection with this. Here the Christian theme of the Passion is interpreted in an adaptation of Mantegna’s The Dead Christ and Rembrandt’s The Anatomy Lesson of Dr. Deyman. His quoting of these works accentuates the nearly tangible corporality of the semi-reclining, lifeless rogue, with his opened abdomen and skinned skull. Though the title given by Mulders does evoke the Passion, he makes his depiction much more carnal, and thereby more gripping, by remaining true to the spirit of his predecessors. During this period (still the late 1980s and early 90s) Mulders makes suffering visible, to an even greater extent than with paint, in one of his photocollages. Fragments of Passion paintings by Dürer, Mantegna and Holbein find visual compatibility with the naked and contorted body of a black youth from an American ghetto. The slow-motion dance of a policeman and the person being arrested echoes the image of Christ’s shackled and lashed body along with those of his bare-chested executioners. All of these figures are striking due to their well-proportioned appearance. Cruelty transforms into beauty and thereby becomes even more heart-rending. In a similar manner, tradition and the topical are brought together in Crack L.A. (1988). Only the table from Leonardo da Vinci’s fresco The Last Supper has been borrowed here. Christ and his twelve disciples have vanished, dissolved into a blur of flesh. The white and the red refer to the universality of the sacrifice which, in the eyes of Mulders, can be a shot-down drug dealer just as easily as the Man of Sorrows. Nowadays, we are given to understand, sacrificing is done on an altar of asphalt. In the work of Mulders, as it takes shape between the late 1980s and into the twenty-first century, two motifs continue to surface with great frequency: dead animals and flowers. The animals—rabbits, geese, pheasants, deer, wild boar and fish  —appear in various stages of decay. We are aware that they are no longer alive, yet it does seem as though some wide-open mouths have just let out a final cry. Initially these creatures are depicted in the paintings with their skins and feathers, then half-skinned or plucked, and finally forced open to the extent that their innards are revealed in all their carnal glory, dripping with blood and pus. Flowers undergo similar treatment. They turn into paint just when, having reached the point of full blossom, they begin to wither. Lilies are so flared open that they are about to fall apart; tulips have already let go of their petals, and roses become darker with each painting as they decline into a blackish dryness. The persistence with which animals and flowers continue to force them-selves on Mulders, year after year, and the organic accent given to them in their seemingly lifeless state, betray a strong fascination. This is precisely where Mulders mitigates the possible preconception that he would have a one-track and exclusive fixation on death and decay. His cyclical approach to the motifs, keeping pace with the passing of seasons, shows the contrary: that the full circle of growth and decay is the major theme with Mulders. Nowhere is the continuity of earthly existence more visible than in deterioration, whether it be that of a human, an animal or a plant. When a body yields its last breath or a flower is cut from its soil, a new phase of life begins. That presents itself in the changes that take place in the ‘mortal’ remains. Mulders’s interpretation of his life as an artist led him to discover those predecessors who managed to evoke flesh in all its palpability and moreover infused it with spiritual value. That is pre-eminently the case with Rembrandt. Not only has his Anatomy Lesson been of major significance to Mulders, but the painting depicting a slaughtered ox, in the collection of the Louvre, gave him direction as well. Rembrandt did not limit himself to a true-to-life portrayal but drew inspiration from the skinned carcass in order to apply the paint onto the linen as ruggedly and loosely as possible. Not only realist novelists such as Zola and Huysmans acknowledged this work as a masterpiece that anticipated their own views; variations on it would also be carried out repeatly by Chaim Soutine, whose work Mulders greatly admires. 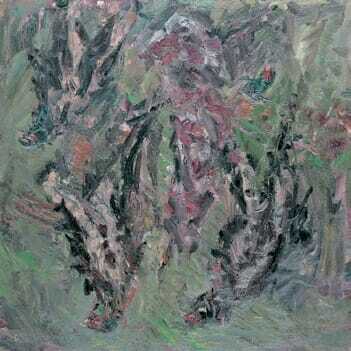 With Soutine as the link, a continuous line can be discerned between Rembrandt and Mulders. The three share a concern for suffering as an existential theme and attest to that in their works. Mulders’s appreciation of predecessors such as Grünewald, Dürer and Goya is founded on the same basic principles. Separate consideration should be given to the role that Francis Bacon has played in the painterly development of Mulders. 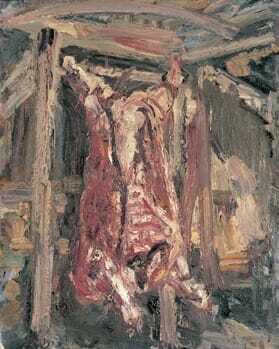 Since the start of his career as a painter, Bacon continued to go back to the motif of the Crucifixion. When asked what it was about this loaded subject that intrigued him as a non-practicing Christian, he said that nothing could be more suited to the portrayal of human emotions and behavior. In his wilful revolt against good sense and propriety, frequently deemed controversial, Bacon’s stance was a far cry from realism. He was sooner concerned with allowing the soul to loom forth from the paint. Perhaps that is why he depicted the crucified body in his oldest known painting, from 1933, as though it were a skeleton made visible by X-rays or, as in Fragments of a Crucifixion (1950), an owl or a bat still fluttering while nailed to a pole. Bacon’s orientation to tradition is also evident in his preference for the triptych. While this must have met his need for structure, it is also a reference to Christian iconography and the function of the altar (not infrequently adorned with a triptych), the ritual ecclesiastical place in which the sacrifice of Jesus is remembered and celebrated. Initially there seems to be a strong similarity between the ‘walls of flesh’ that Mulders produced at an early stage of his oeuvre and the images of deformed bodies that we know from Bacon’s work. The color scheme (red, pink, white, grey and black) and the choice of subject matter almost automatically give rise to the association. Mulders painted ‘wet into wet’ in these works, the consequence being that they are covered with a thick layer of paint and look like slopes of a volcano encrusted with hardened currents of lava. Bacon, on the other hand, managed to paint ‘scantly’, as Mulder’s put it at the time, indicating some degree of jealousy. The two differ in connotative terms as well. Bacon’s mutilated and contorted figures, often no longer even recognizable as human beings, have been in-corporated into a grotesquely distorted reality. The themes of Mulders are dominated by the great narrative of the Passion, which is partly made visible in the fate of animals and flowers. Bacon vulgarizes the human condition; Mulders remains deeply involved in it. Here I’d like to use the word ‘enlightenment’ to designate one of the most striking changes to take place in the work of Mulders during the 1990s. Earlier paintings, particularly Grond in Christus, Bloemen Maesta I and II and the two Pietàs (all dating from 1987) are immersed in pitch-black darkness. Gradually more color and light enter the palette, certainly when the lilies, tulips, sunflowers and irises become subjects. While this is going on, the activities broaden into other genres and media. Mulders begins working intensively in watercolor and photography, experimenting with art reproductions, advertisements and collages made of his own photographs, and collaborating closely with the textile artist Claudy Jongstra. Shortly before the start of the new century, he is invited to create a stained-glass window for the village church of Rhoon. The assignment is well suited to his affinity with the artistic and spiritual legacy that goes back to medieval Gothic traditions, but which also has modern representatives in Marc Chagall and Henri Matisse. 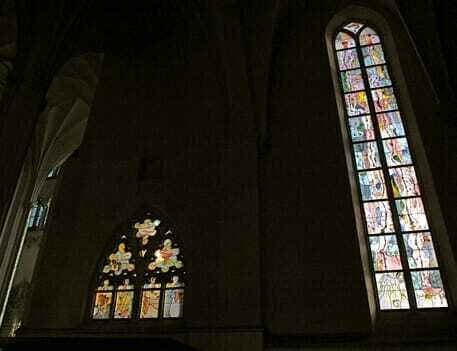 At the same time, the stained-glass work brings into view the common ground with symbolists (Paul Gauguin, Emile Bernard and others) and Jugendstil artists (such as Johan Thorn Prikker) from the fin de siècle. Like them, Mulders will return to the definition of areas of color with line and contour. In the most recent work of Mulders, that development has settled into place. In the Rhoon window the floral and fish motifs appeared once again, but this time as elements in a Creation narrative, in which everything refers to Jesus. A year and a half after that initial assignment, Mulders was given the opportunity to illuminate two windows of the Stevenskerk in Nijmegen. There, too, organic forms taken from nature point to crucifixion and resurrection. In one window we see two vertical lines transecting the glass. It’s possible to see these as branches, as a skeleton-like structure or even as veins through which life is pulsating. The impression of symbolism rooted in Christianity is heightened by small figurative motifs that play around the predominantly abstract depiction: a frequently recurring pelican, which according to legend pecks open its breast in order to feed young with its own blood; and the serpent which refers both to the start of Genesis and to the alchemistic ideal of a union of opposites. Here the microcosm of cells, veins and plasma takes on a connection with the universe radiant with light, as emphasized by a predominant use of the colors pink (the body) and blue (the heavens).